Do you have ceiling water damage in your home? Does one of your ceilings have discoloration or dampness? It could be from a roof leak, a pipe between floors or a leak from your HVAC if you have your HVAC in the attic. Typically homeowners won’t be able to notice a leak in their home until there are visual signs of it. In many cases like the ceiling, it is an ongoing issue, but needs to be fixed as soon as noticed. Once you notice you either have discoloration, dampness or an odor possibly from water damage on your ceiling, the first thing to do is access out where the water is coming from. This might require you to get into your attic. If no signs of leaking or clogging is evident from your HVAC, the next logical location to check is your roof. Water typically comes in through worn, broken, or missing shingles where nails have worked loose or through corroded or poorly sealed roof flashing around vents, skylights, or chimneys or along the intersections of roof planes. If you find this to be the case, it’s best to call a roofing professional and have them inspect your roof and determine the correct course of action to repair the issue that is causing water to get into your home. 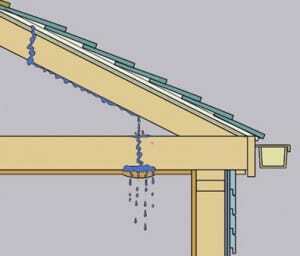 A roof leak often travels down a rafter, showing up down-roof from where it begins. Once the roof, or cause of origin has been fixed, you can focus your attention on the damaged portion of your ceiling. The best option on repairing the ceiling would be to remove the damaged ceiling and replace it with new drywall. One of the things to consider when repairing the ceiling is the size of the damaged area. You may want to hire a restoration contractor who would have the necessary tools and PPE. Many times, if the water has been an ongoing issue, there is mold on the surface or backside of the drywall and that makes the removal process more dangerous. If this is the case, you should hire a restoration professional who can properly handle the mold removal process without cross contaminating the rest of your home. If you decide to pursue the project yourself, before you cut out the damaged section of ceiling, know what’s on the other side of the drywall. Is there electrical wiring, plumbing, gas lines, HVAC ducts, wood joists or metal support runners? If you can’t see what’s on the other side, cut a small inspection hole in the drywall with a utility knife and look inside with a flashlight and small mirror. Click here for a more in depth review on repairing the ceiling water damage yourself. If you have ceiling water damage call First Restoration Services today for assistance.